Communopoly was invented by (I think) Chris Field and Michael Richards. Communopoly takes about half an hour to play – which makes it significantly superior to regular monopoly. The loss of players from the game usually results in money being deposited into the State Bank, this means that the game speeds up significantly, and tends to end quickly after some players are lost. Our experience of the game is that the players are all executed shortly before winning the game. The more players you have, the further you get, but at around 6 players the odds are still a little against Communism. 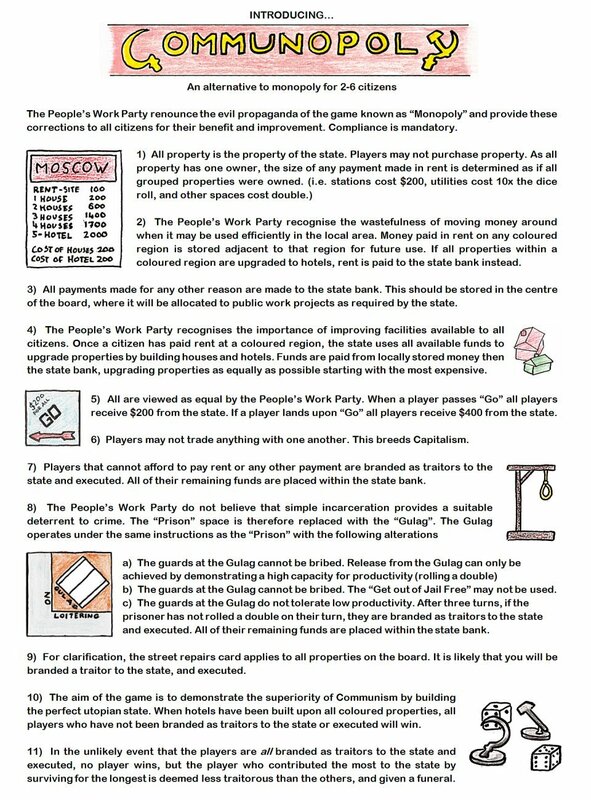 You can grab a PDF of these rules Here – Why not print it out and add it to your Monopoly set?